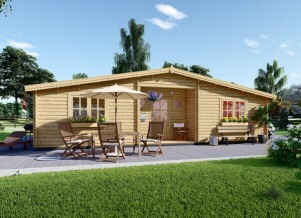 A log cabin is often revered not because of its sturdiness (though that is a part of it), but because of its aesthetics. Wooden houses have a certain flair about them, something earthy and old, classic and traditional, beautiful and rustic. 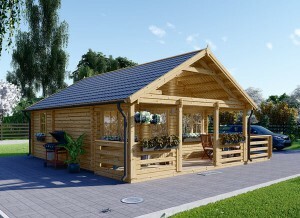 Unfortunately, so many people miss the mark with decorating one, which renders a log cabin less impressive by default. One example of where decor often falls short is on a balcony, patio or terrace. 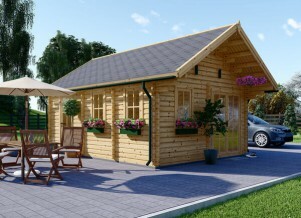 Yes, believe it or not an unfurnished balcony can seriously impact the overall function and look of a log cabin. You have some outdoor space, why not use it? 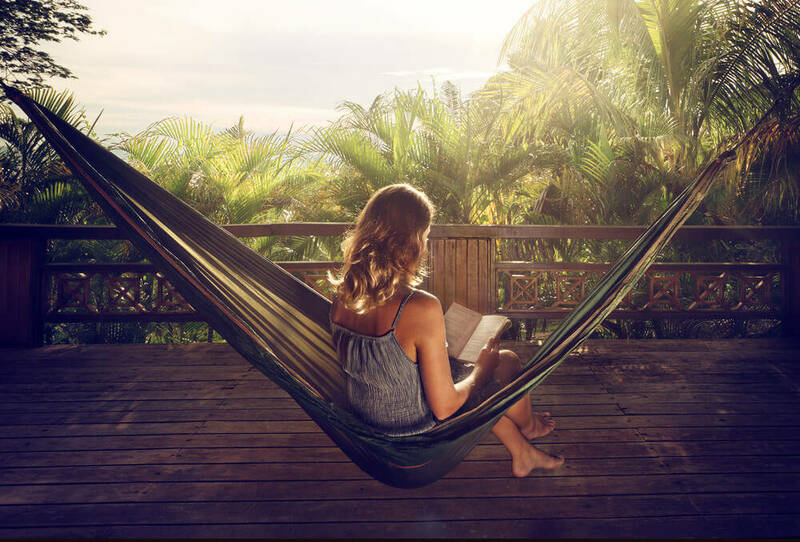 If you are purchasing a log cabin, looking to build one or already have one and want some design ideas to make the most of the area, here are some awesome, creative and gorgeous terraces, patios and balconies that will prove a porch isn’t just an empty space. Why not have a meal out in the fresh air? This patio takes advantage of a larger amount of space to provide an entire dining set for people to take their meals under the stars or in the sunshine. With the right style of dining set you don’t even need a covered patio. Just make sure in inclement weather to throw a cover over the table and chairs to keep it from weakening the materials over time. Have you ever seen someone wearing a ton of makeup that has been strategically applied so it looks like they are not only not wearing any, but made no effort at all to look the way they do? This terrace is the very definition of that idea. The furniture is beat up but in a rustic and beautiful kind of way. A few items look like they have been placed on the table with no thought. The truth is that this was a carefully crafted design that is meant to look casual. Just imagine being with your partner on this romantically lit terrace. You are drinking a bit of wine, holding hands, maybe having a meal or some cheese and fruit. You are sinking into the moment, looking into one another’s eyes. It is an experience so many people will try and recreate in a fancy restaurant or an exotic hotel. Yet you can get it right there in your home by merely stepping outside. 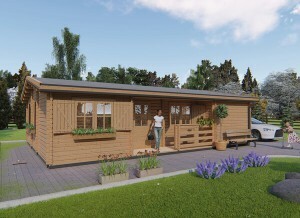 Not every log cabin has a large yard or space for a garden. Even if it is did, there are other factors like the health of the soil, the pests nearby and the weather than might dictate how and when you can grow anything. If you want more control you can use a terrace to create a little potted garden that lets you grow vegetables, herbs or flowers. It takes very little space and means you can select items that don’t usually flourish in your climate or yard. This is a godsend for anyone who doesn’t want to completely pull up and replace the soil on their property to make it more enriching. Have very little space but big ideas? These homeowners did and their solution was elegant and functional. They used an L bench with some cushions and a few other surfaces to make an attractive patio where they could hang out without too much of a fuss. Notice the use of plants and trees as well that take advantage of the natural environment and make it look more even without being cluttered. Think functional. Have you ever been to someone’s home and their decor is beautiful but you aren’t afraid to so much as sneeze because you might mess something up? Good design isn’t just attractive, it is also functional. So when you are creating your perfect terrace, keep in mind that you want something that serves a purpose beyond looking good. Don’t be afraid to be colorful. Many folks decide to keep their log cabin kind of muted to take advantage of the natural look of the wood, which is a great choice. 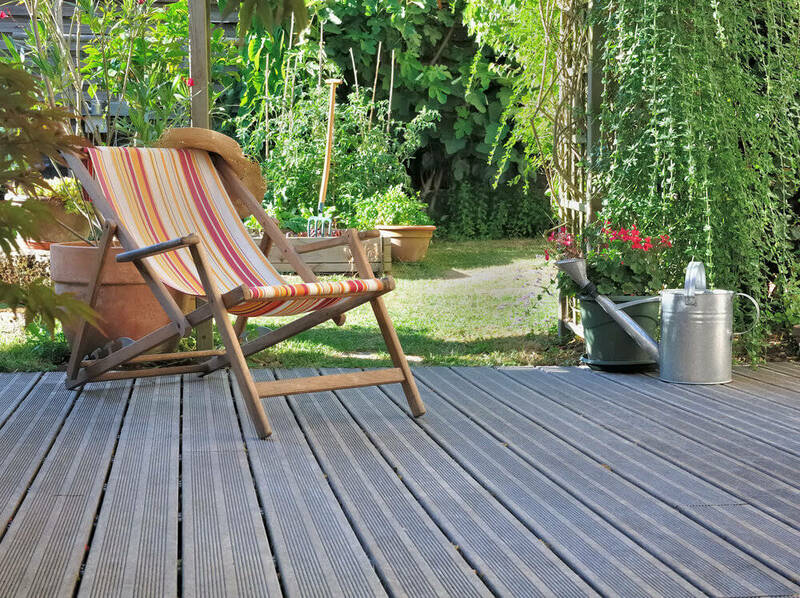 But your patio is in a new space and you shouldn’t be afraid to stretch your color pallet a bit more. Bold colors really work in the outdoors. Minimalism saves space and headaches. Minimalism is seen as a way of life, but it is also a fantastic way to simplify your decor without sacrificing aesthetics. Think clean lines, simple furniture, few accessories, ect. A terrace or balcony is great for minimalism because you are operating with limited space. Play around with lighting. Some of the best terraces have interesting lighting as a major feature of their designs. Fairy lights are a major trend around the world, or strung lanterns. Opt for some bulbs that aren’t all white, which can be a little straining on the eyes and bleach out the colors of your decor. Instead try an off white, light blue or other muted color that you can turn on for a romantic night on the balcony. Imagine yourself on the terrace. Think of you and your partner, family or friends on the terrace. What are you doing? What does it look like? What is your dream? That is the best possible blueprint for planning out your furnishings, while also basing it off of function. For instance, will you just be relaxing and drinking wine? Eating a meal? Reading? Talking? Make a hangout pad. Speaking of dreams, is yours to have the ultimate hangout pad? Your patio is a great space for it. Aim for taking advantage of every bit of space. Put in some seating, mayne a table or two. Consider creating a bar. Put on a portable fire pit. Whatever works for the space, use it and give your guests an awesome place to chill. As you can see, there are plenty of options to choose from. 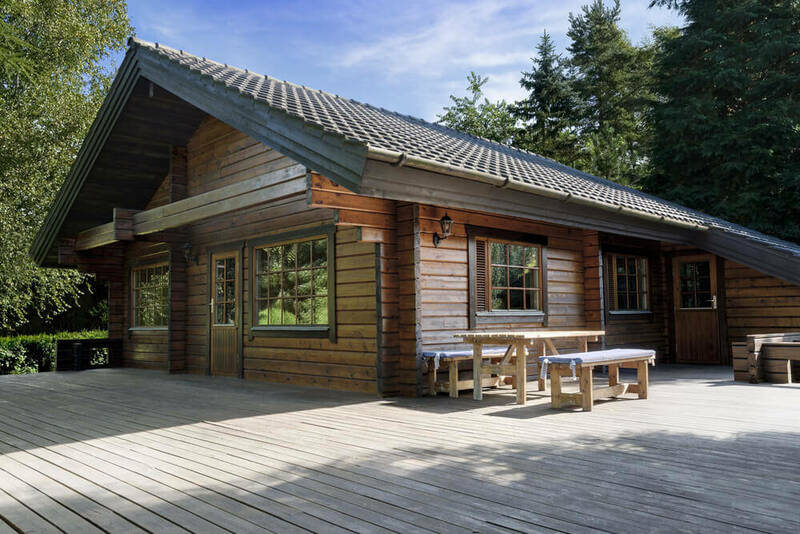 So get creative with your log cabin design!